Over the last few years Wayne Fox made a reputation for producing REAL WORLD practical effects for the ‘workers’ out there. Unlike so much of the new magic released lately, Wayne’s effects were not invented to sell. They developed through professional performance. It’s always a great feeling each time he sends us a preview of his latest creation, because we know it’s not going to be just another re-hash of the latest craze. He steps over the countless ‘coin in bottle’ clones, the 1001 snap colour changes, impression pads and psychological suggestive mentalism. His magic is released for one reason only – it works and goes down a storm actually performed for the public. Making dry-mounted playing card gaffs just got a whole lot easier! 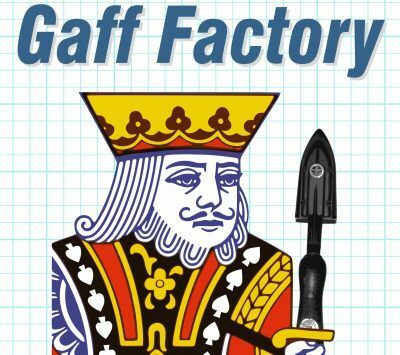 Craig Matsuoka’s exceptional guide to making your own gaffed playing cards is now available through The Merchant of Magic. Craig has kindly agreed to supply you with a section of the book as a ‘taster’. In this FREE download, you will not only learn the secret to removing the face or back of a playing card quickly and easily, but also get to find out just how powerful these techniques will move your card magic on to the next level. Enjoy…. You can find complete 80 page ebook ‘The Gaff Factory‘ in our Instant Downloads’ section.